When you graph conic sections on the polar plane, you use equations that depend on a special value known as eccentricity, which describes the overall shape of a conic section. The value of a conic’s eccentricity can tell you what type of conic section the equation describes, as well as how fat or skinny it is. When graphing equations in polar coordinates, you may have trouble telling which conic section you should be graphing based solely on the equation (unlike graphing in Cartesian coordinates, where each conic section has its own unique equation). Therefore, you can use the eccentricity of a conic section to find out exactly which type of curve you should be graphing. 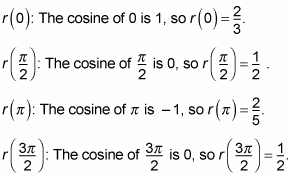 Here are the two equations that allow you to put conic sections in polar coordinate form, where (r, theta) is the coordinate of a point on the curve in polar form. Recall that r is the radius, and theta is the angle in standard position on the polar coordinate plane. If e = 0, the conic section is a circle. If 0 < e < 1, the conic section is an ellipse. If e = 1, the conic section is a parabola. If e > 1, the conic section is a hyperbola. The first thing you need to do is make the denominator begin with 1. This denominator begins with 4, so you have to factor out that 4 to find out what k is! Therefore, the constant k is 1/2 and the eccentricity, e, is 1/4, which tells you that you have an ellipse because e is between 0 and 1. These four points are enough to give you a rough sketch of the graph. 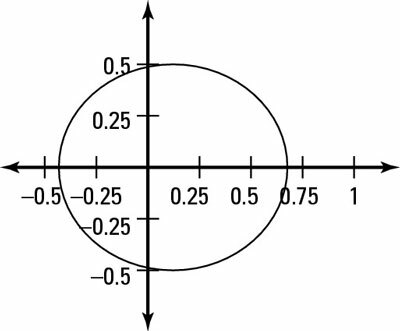 The graph of an ellipse in polar coordinates. You can see the graph of the example ellipse in this figure.